This manual is intended to be a convenient reference guide for observers certified to use the Kuiper telescope and CCD Imager (Mont4K). Contact the Steward Observatory (SO) operations office (621-5136; bpeterson@as.arizona.edu) or Paul Smith (621-2779; psmith@as.arizona.edu) if you need to be certified. Emphasis is placed on the safely of observers and the equipment in this document. A hardcopy of this manual is located in the 61" control room. In the event of a discrepancy between the Web and hardcopy versions of this manual, the Web version will take precedence. The manual was created with the help of Betsy Green, and is based on her extensive notes on the operation of Mont4K. There are several links to these notes scattered throughout the following sections. Dave Trilling, Jim Grantham, Mike Lesser, and Bob Peterson also contributed to this guide. Comments and suggestions for this manual should be directed to Paul Smith. 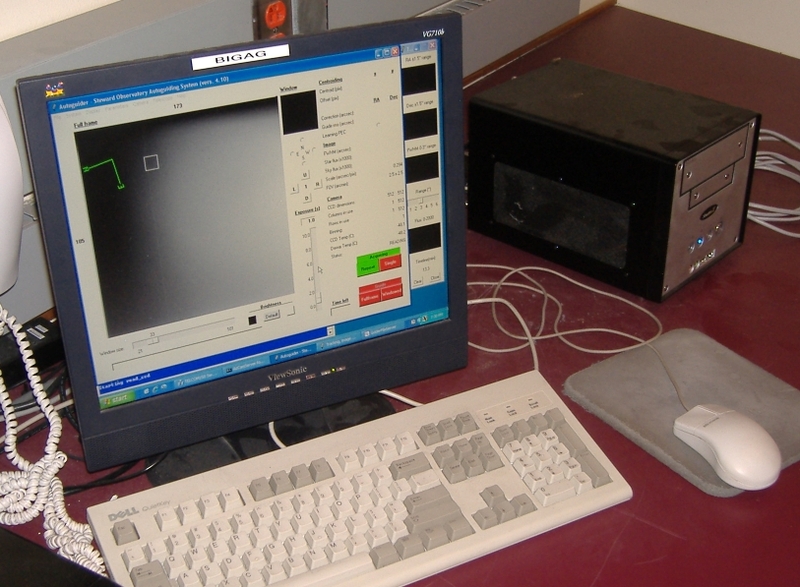 The "Montreal 4K" (Mont4K) CCD Imager was made possible through the support of the University of Montreal and the Canadien Research Council. 2. Basic Information About Mont4K. Back to the top of the do cument. Please report any problems encountered with Mont4K in that night's Trouble Report. Be as detailed as possible. It also helps in diagnosing problems if suspect CCD images are identified so that they can be found and examined by support/technical personnel. Lightning. Make sure that the instrument and facility are properly protected from lightning when thunderstorms are in the area (see Section 4). Static electricity. The CCD is exceptionally sensitive to static electricity. Never touch the instrument (dewar, electronics boxes, etc.) before grounding yourself (see Section 5). Impact with an elevated observing platform or objects on the platform. Please make sure that the platform and objects on the platform do not get in the way when moving the telescope. We ask observers to adhere to the Mt. Bigelow observing facility guidelines to protect the telescope and instrumentation from weather that will damage these valuable research facilities. If there is a danger of LIGHTNING, make sure that Mont4K and its associated computers are powered off . Please follow the lightning shut down procedure for the observing facility. The CCD dewar requires a fill of liquid nitrogen (LN2) every 24 hours (i.e., the hold time for the CCD dewar is >24 hours). Make sure that the LN2 fill is documented on the whiteboard on the observing floor. The CCD is exceptionally sensitive to static discharge. 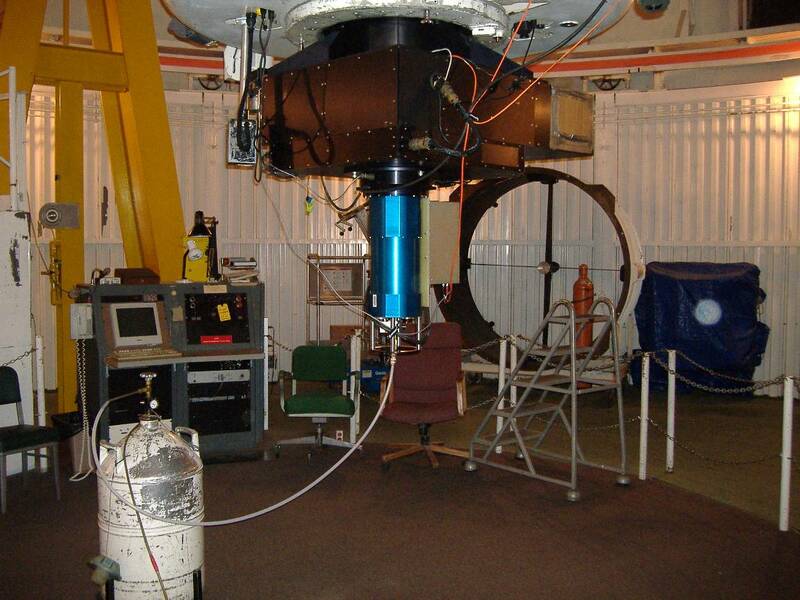 ALWAYS ground yourself using the metal supports of the observing platform safety chains, hand paddle pole, and/or clamps for the instrument rotator before touching the CCD dewar, filter wheel, or electronics boxes. For dewar fills, ground yourself and wear the supplied grounding wrist strap before inserting the fill tube into the dewar. For safety, do not leave the observing floor until the fill is completed and all valves are closed. If there is not enough pressure in the storage dewar to transfer LN2 to the CCD dewar, attach the the dry nitrogen tube (to the right of the south pier) to the pressure relief valve on the storage dewar. Turn the green valve handle to increase the dewar pressure. Make sure that all valves are closed when the CCD dewar fill is completed. More detailed instructions can be found here if you need to reconnect cabling after a lightning shut down or encounter problems following the startup procedure listed below. 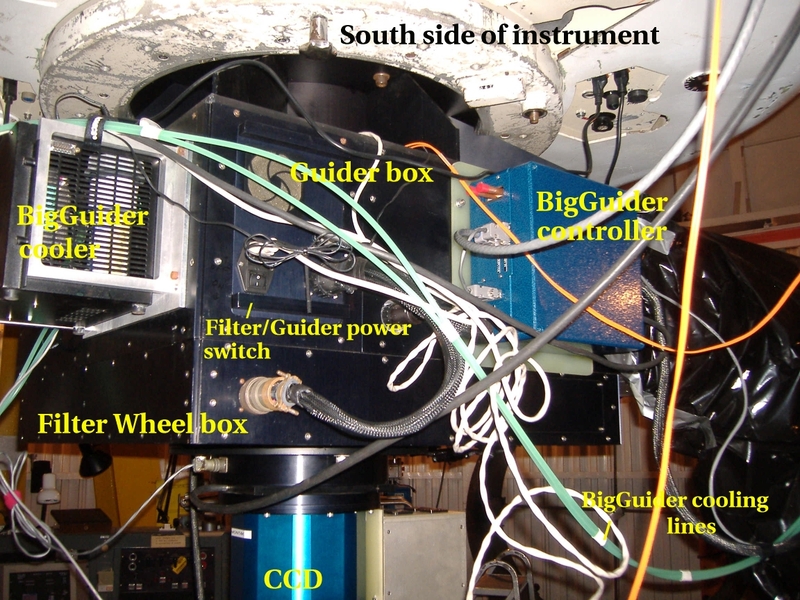 After turning on the MAIN power and TELESCOPE power (see the Observing Manual) turn on power to Mont4K and its controller (one switch located on the north side of the guider box). Turn on the power to the filter and guider boxes (single switch on the north side of the guider box). Toggle the Run/Load switch on the north side of the guider box to properly initialize the filter wheel and make sure that the switch is left in the Run position). Turn on the power to the shutter (note that the shutter box is located on the west side of the guider box at the NW corner). Power up the BigGuider system. Turn on the computers ("TCS", "kuiper", "bigccd, and "bigag"). Make sure that the NBS clock is on and displaying the current UT. Log into the TCS computer (just hit <Enter> when asked for a password) and start up TCS using the "TCS150" icon on the display. On bigag, start the Telcom Server ("Telcom150 Server" icon). When the Telcom window comes up, type <backspace> to see the telemetry stream from the telescope if you wish to verify that Telcom is active. See the detailed startup directions to learn about the function of the Telcom Server. Log into kuiper with the username: bigobs and initiate the dataserver, galilserver, filter wheel (+guider) GUI, and other tasks. Close all windows that automatically popped into existence when logging into kuiper as bigobs. 4th window: type "fw-gui". Once the filter wheel GUI appears, use it to HOME both the X and Y motors of the guider probe stage. IRAF window: type "cl < mont4k.tasks"
5th window: type "quicklook off", then "./watcher_window". In the resulting IRAF window that will appear, type "watcher" and enter the name of an existing directory on kuiper (create the desired data directory beforehand) where data from the Mont4K CCD will written. All of these windows can be arranged, minimized, and re-labeled as desired, but do not destroy any of them. The quotation marks used above are NOT part of the commands. At the finish of all of this there should only be one ds9 open for the display of CCD images. Important: see the detailed kuiper login instructions to learn how the processes that kuiper controls need to be initiated and to troubleshoot unexpected problems with the operation of Mont4K. Note: make sure that no other ds9 windows exist before starting "dataserver". On bigccd, start AzCam by double clicking on the StartMont4k icon. This should do a CCD reset (if the Mont4K power switch and controller are turned on) and Mont4K will then be ready for use. Check the time on bigccd. this should be the time from the GPS server, but after a cold start, it may not have had time to synchronize. See the detailed startup directions (bottom of that document) to adjust the clock. The filter wheel holds up to six (6) 5"x5" filters and is controlled from the kuiper computer. The current available filter set includes a standard UBVRI bandpasses. These filters are parfocal and there are available adapters so that 3"x3" and 2"x2" filters can be inserted into the wheel. Filters should only installed by a member of the 61" Operations crew. Observers are requested to inform Operations of their selection of filters for their observing run by submitting an Observers Request Form several days prior to the start of their run. IMPORTANT NOTE: When the power is turned on to the filter wheel box, it always starts up in Load mode, even when the Run/Load switch is flipped to Run. The process that makes the current filter position available to the CCD computer (galilserver) won't work properly unless the filter wheel is in Run mode. Therefore, whenever the telescope power is turned on or the power to the guider/filter wheel boxes has been turned off, it is necessary to flip the switch on the filter wheel box to the LOAD position, and then switch it back to RUN. If you can't see these words in the red LED on the northwest corner of the filter box, you may have to turn the LED display power switch on first. Open the mirror covers with the telescope pointed at zenith. Move the telescope to the flat field screen by offsetting the telescope from the stow position (HA=0h, EL=90°) by -65.5° in Declination. Move the dome so that the orange arrows line up and the telescope is pointed at the flat field screen. The flat field lamps can be turned on at the control box located on the east side of the south pier. The number of lamps to be used can be chosen and a rheostat adjusts the intensity of the lamps that are turned on. If you are planning on a lengthy calibration session using the dome flats and will not be present in the dome during a portion of the calibrations, it is best to at least disable the telescope drive motors within TCS. Do not open the mirror covers even for taking dome flats if it is raining/snowing or if the humidity is too high for observing. There is a PDF version of the documentation for the AzCam Software. In the typical data-taking mode, CCD exposures are saved in the observer-specified directory on kuiper as merged, bias-subtracted FITS files. The raw data files are saved in the "raw" subdirectory as FITS files with two extensions. Extension  is one side (2K×4K pixels) of the CCD image and  is the other side. Betsy Green has written several scripts that observers may find useful when using Mont4K. These scripts can be found on kuiper in the /home/bigobs/sdb/com/ directory. Please contact Dr. Green directly for more information. 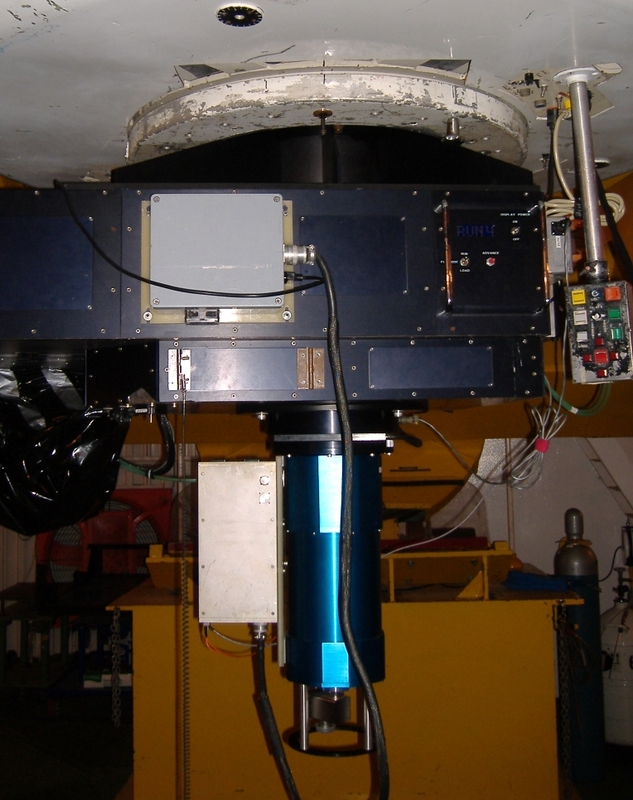 The Kuiper Telescope CCD guiding system is designed to be used along with the Mont4K imager and is essential if exposure durations longer than about 5 minutes are desired. Please refer to the BigGuider operations manual for information concerning the capabilities and use of this facility system. Turn off power to the Mont4K, the guider and filter boxes, and the shutter at the telescope. 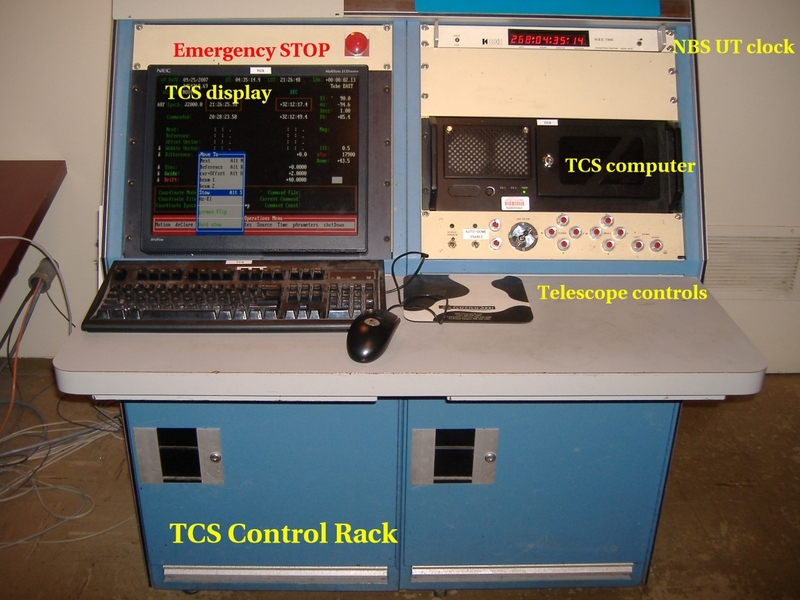 These switches can be left on in the interest of CCD stability if the weather is not threatening and is not forecast to become threatening while observers are away from the dome. Please remember to stow the telescope and to disable the servo drives both in hardware and software since the MAIN and TELESCOPE power will need to be left on if it is desired to leave the instrument on. Power down the BigGuider and its cooler (this need not be done if conditions allow the Mont4K to be left on). Follow the directions for shutting down the telescope described in the Observing Manual. If the weather is threatening, or the observatory site will be left unmanned for a significant amount of time, follow the directions for a "lightning" shut down as well. If a "lightning" shut down is performed, one can follow the detailed shut down instructions to properly "safe" Mont4K, its associated computers, and the telescope.